Kendrick KADS' Scott, born July 8, 1980, and raised in Houston, Texas, is an artist of incredible depth, talent and determination. 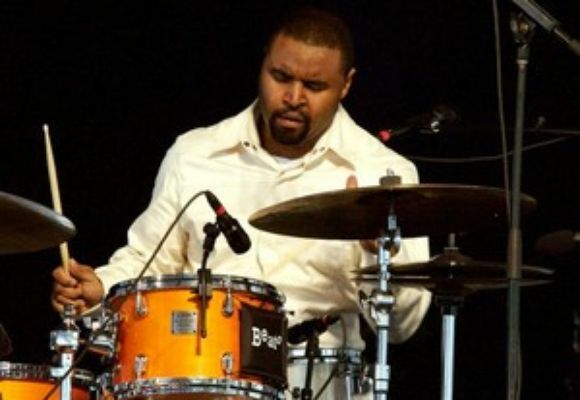 He has been featured in Terence Blanchard's band for the last several years and has appeared on the Grammy winning and nominated recordings, A Tale of God's Will, and Flow, on which he contributed original compositions and orchestrations. Since arriving in New York City in 2003 Scott has appeared on more than 21 records as a sideman, and on the soundtracks to seven feature films. The young master is also recognized by the Yamaha Corporation, Remo, Vater, Puresound, Sabian, Protechtor and Danmar as a member of their prestigious group of endorsers. However, touring the world and recording with the likes of Blanchard, as well as John Scofield, Maria Schneider, Lizz Wright, Wayne Shorter, David Sanborn, Dianne Reeves, The Crusaders, John Patitucci, Stefon Harris, Kenny Garrett, Pat Metheny, Nicholas Payton, Gary Burton, Mark Turner, Joe Lovano, Herbie Hancock, David Sanborn, Roy Hargrove, plus playing on numerous film soundtracks by Spike Lee and other filmmakers, is not nearly enough for the uber-talented twenty seven year old. While excelling in the business of playing music, Kendrick Scott decided to plunge head first into the business of running a record label. In preparation for his debut recording as a leader, Scott discovered the need for himself and other artists to have a new platform from which they could release their music. The drummer also had no desire to place the destiny of his first recording in the hands of a traditional record label. In an effort to cross stylistic and cultural divides, bypass the corporate structure, have complete creative control over the finished product, and expand the jazz community to nascent followers, World Culture Music was launched with the release of Kendrick Scott's Oracle  The Source. The critically-acclaimed, artist run label has just released its fourth recording, Synesthesia, from trombonist/composer Nick Vayenas (currently on tour with Michael Buble), and has also released The Wish from vocalist/composer Julie Hardy, and Between The Lines from guitarist/composer Mike Moreno. Kendrick Scott grew up in a household of musicians. He first encountered the drums in church where his parents and older brother were involved in the music ministry. By age six Scott's parents (Stepheny and Kenneth) could see that the young man's interest in the drums was a not a passing fancy, so they set him up with sticks, a pad and lessons. As a kid, I remember listening to the music at church and feeling chills in my body. I knew then, that music was my calling. he exclaims. As an undergrad, Scott gigged with Pat Metheny, Gary Burton and Kenny Garrett. Upon graduation he already had offers from Joe Sample and Terence Blanchard. Scott is influenced greatly by many drummers, including hometown up-and-comers Eric Harland and Chris Dave, as well as masters like Tony Williams, Papa Jo Jones, Roy Haynes, Elvin Jones and Max Roach, but he consistently displays his own distinctive style with a brilliant use of space, timbre, dynamics and propulsion. "In my drumming, I aim for continuous forward motion while paying tribute to the influences that have guided me and shaped who I am as a musician today." The title track of his debut CD The Source, was originally recorded on Terence Blanchard's 2005 record, Flow, for Blue Note Records. Flow features Scott as well as pianist and producer Herbie Hancock who plays on Scott's tune. "Being a part of Terence's group for three years has been a godsend. He has given the members of the band freedom to grow and cultivate our voices. When we went in to record The Source' Herbie said he would play on it; one can only imagine how I felt." If that weren't enough, Scott's composition was the Grammy nominated track (for Hancock's solo). "I knew when I went in to record my record that 'The Source' would be the title track. It's is an homage to humanity. While the world is at unrest, I believe compassion will prevail." Perhaps humanity and compassion are the roots from which all that is good about Kendrick Scott grows from. He is one of the bright stars in an amazingly talented group of young drummers on the scene today. He remains a first call player for major artists because his humanity and compassion extends into the notes and phrases he chooses to play, which makes his playing consistently ring true as it springs forth from an ego-less, honest place. These deep roots, connected to his mentors, inspirations, peers, his parents and to the church, enable Scott to be present and in the moment, bringing to the table the wisdom of a veteran musician and the adventurousness of a perpetually curious young artist.